The last sentence says it all – we can picture the evening sun on the caravan site and practically smell the barbecue as we read! Postmarked ’17 LES MATHES 16h 45 28-7-1988 CHARENTES MARITIME’ the card features a view of Le Pont du Diable au Platin, which is a popular natural feature of Saint-Palais-Sur-Mer on the Atlantic coast of France. 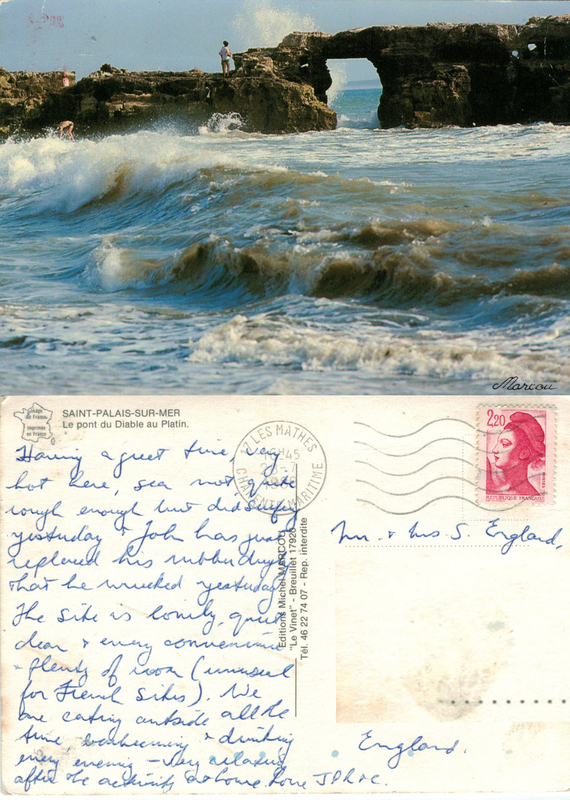 This is another card from J,P,R & C. John, once again features, as a middle aged man who has ‘wrecked’ his rubber dinghy in the surf! 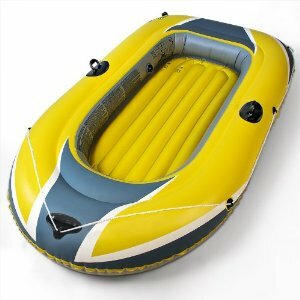 This comes as no surprise to me – during the 70’s our family and theirs spent many happy holidays in Cornwall; a big feature of these holidays was John and my Dad endlessly pushing us children over the surf in a rubber dinghy and, inevitably, us squealing with laughter as we were tipped out.